This can be a little tricky. If you want to use your own domain name (for example, publication.example.com) instead of the Paperturn domain name for the URLs, this is how you do it. You need the PRO version to do the following. Let's say you have your own website called www.example.com and want to use your domain instead of paperturn.com. publication.example.com, brochure.example.com or whatever you prefer. In this example, we have chosen publication.example.com. You need to create a CNAME record within your own domain DNS service to route queries for publications. The CNAME needs to point to www.paperturn.com. If you have possibility to insert TTL, just ignore it or insert default value. Please notice that it can take from 1 minute to 6 hours before the changes from your DNS host are active. Wait one day before inserting your new CNAME in Paperturn. You want to be sure that it is active before use. 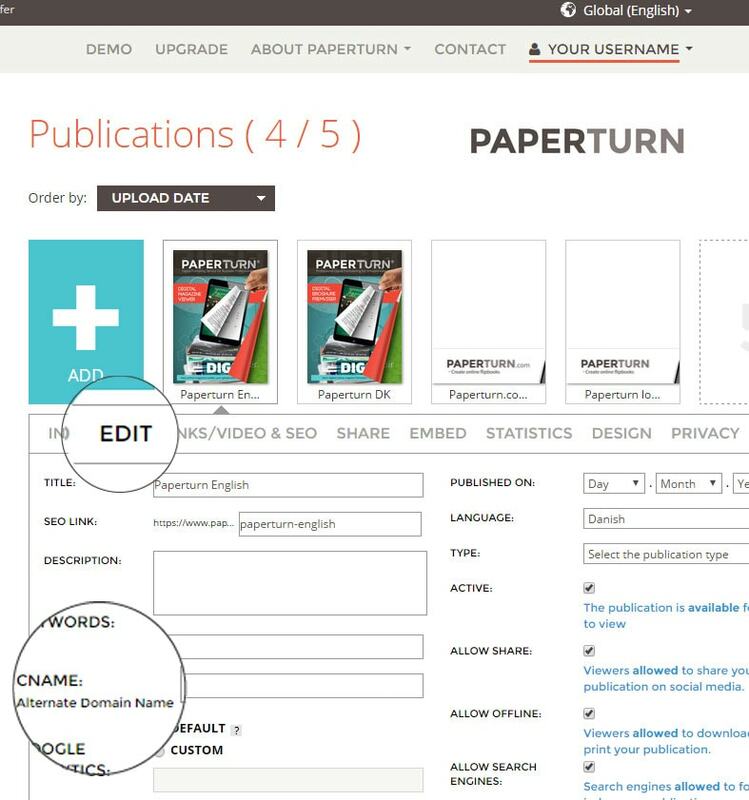 Afterwards, please log in to paperturn.com and go to one of your flipbooks and then click "Edit". Now you can type in your selected CNAME.